Melissa Seymour: Hi, Andrea! Please tell us a little bit about yourself and what you do. Andrea Beaty: I am the author of ROSIE REVERE, ENGINEER, IGGY PECK, ARCHITECT, ATTACK OF THE FLUFFY BUNNIES and other books for kids. I previously studied biology and computer science and worked in IT for many years. Now, I write books about wonder, passion, and killer alien rabbits. I also visit schools around the world (in person and via skype) to share my passion for creativity, writing, and books. MS: When did you know you wanted to be a writer? Why? AB: I never set out to be a writer. I was about thirty when I came to it. Before that, I was busy exploring everything that interested me: biology, computers, literature, history, music. Everything. When I started reading books with my kids, I started getting ideas for stories. My exploration ultimately made me a writer. It gave me stories to tell. That is why I tell kids to read everything they can and to explore all the things that interest them. Everything is connected. You never know where it might lead! MS: We absolutely love Rosie Revere, Engineer! Why did you decide to write this book? AB: Thank you. I also love this kid. She is smart and curious and passionate. (This seems to be a theme in my books.) I wrote the story after I saw David Robert’s illustrations for IGGY PECK, ARCHITECT. David is simply brilliant. The students in Miss Lila Greer’s classroom intrigued me. As in any group of kids, they have their own personalities and talents. I was especially curious about Rosie after I realized that she never reveals both of her eyes in the book. She shyly tries to hide behind her swooping bangs. I knew I wanted her to be an engineer because I figured she would have lots of great ideas. (And I wanted to see what wonders David would help her create.) As always, his illustrations were amazing. As with IGGY PECK, ARCHITECT, the illustrations are deceptively simple looking, but they contain so much humor and funny hidden details. I have read each book hundreds of times and still find things I had not seen before. Also, there are lots of tiny references between the two books. Kids love finding them. MS: What was it like finding out that your book was a New York Times Best Seller? AB: It was terrific affirmation that Rosie was reaching kids. Authors and illustrators send our books out into the world and have no clue how a book is doing for six months and often longer. I knew immediately that Rosie was connecting from the wonderful letters parents sent. Rosie inspired their kids to start inventing. They also wanted to hear the book over and over again. The NYT list was proof that lots of families were finding the book. One of the most exciting things for me is that Rosie helps kids embrace the idea that it’s okay to fail as long as you don’t give up. That is an enormously big deal. Kids are so often their own toughest critics and they shut down if things don’t go the way they envision. Rosie shows them that it’s okay. Brush off the disappointment. Figure out what you can do differently. Learn from it and enjoy the process. And have fun! Joy is such a key to learning. 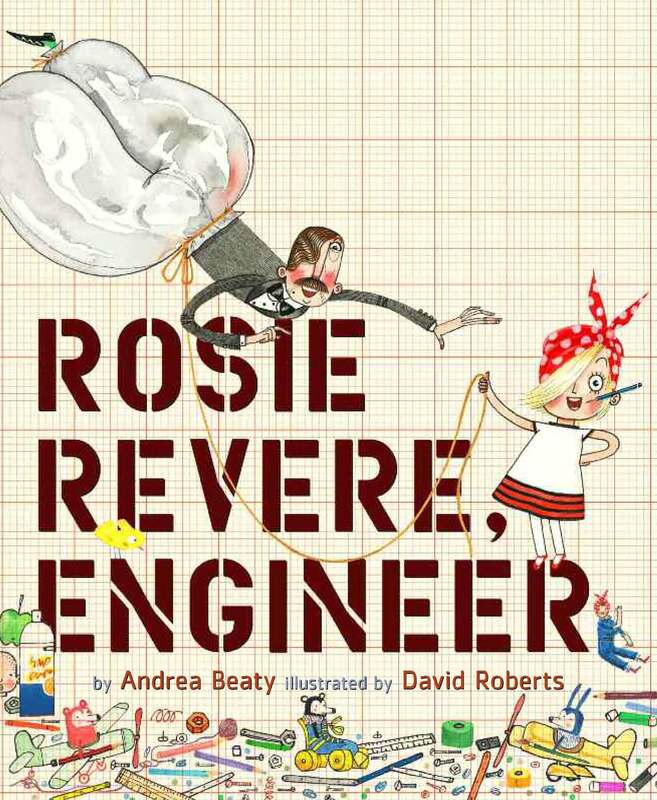 It is also thrilling to see so many girls read ROSIE REVERE, ENGINEER and immediately decide that they want to be engineers. For many, it will be a passing idea. Personally, I had 7,000 careers before I was twelve. But for some, it will become a lifelong goal. And in either case, for engineer to be on that list of options for girls is terrific! MS: Why are strong girl characters so important in children’s literature? AB: We read literature for lots of reasons. It amuses us. It takes us to places and times we can’t visit on our own. It builds empathy. At its best, literature teaches us how to deal with life. We can see ourselves in characters that are not exactly like us. That is why boys also connect to ROSIE REVERE, ENGINEER and girls like IGGY PECK, ARCHITECT. But when a reader sees a character that is like them, it makes the story much more real. Identifying with a character lets us envision ourselves facing and overcoming the same problems. 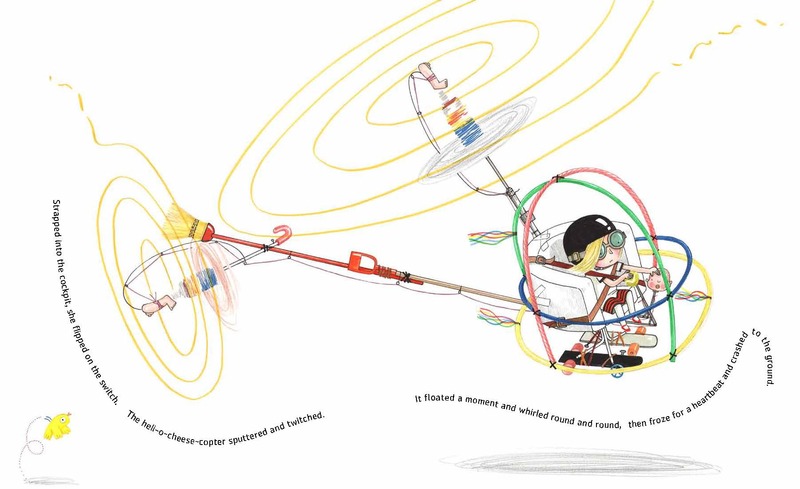 If a shy girl named Rosie can overcome doubt, create a crazy cheese-copter, and deal with its failure, maybe a girl reading the book can make an invention to help someone. That belief makes her stronger and braver and bolder. That belief sets loose an energy that knows no bounds. I truly believe that when we embolden and empower girls, we change the world. MS: How do you think women are represented in the media? Do you think this affects girls? AB: The way media represents women is destructive and it affects our girls and our boys. I think it is a mistake to focus solely on how this affects girls. Both must have realistic views of themselves and each other. Neither can develop a realistic view of women (or men for that matter) based on the unattainable, hyper-photoshopped mutant models presented in advertising and the media. When my daughter and son were very young, I made it my job at every single trip to the grocery store to point out the crazy stupid magazine covers. It was tedious and annoying and crazy-making, but it taught them to question the messages they see all around them. It is absurd and warped that anyone should have to teach their kids what women (and men) really look like. Our species has survived for a long, long time without having to do that. And yet, here we are. I do take heart—a little—that people are starting to wake up about this. The backlash to the Princess Merida changes by Disney made my heart sing. Ultimately, though, we control this. We have got to pony up and stop buying into the nonsense. And that means stop supporting magazines, toys, movies, video games, or TV shows that distort how women are portrayed. Stand up and call people out on it. Money drives this whole thing. Stop making it profitable. Then it will change. Also, we need to change how we talk to girls. We so often make appearances the focus of what we say to girls. We don’t do that with boys. I have been guilty of this many times and am trying to break this habit. Now, when I meet kids at events, I ask each of them one simple question: What do you make? The answers amaze me. AND, they do not follow expected gender boundaries. They are a wonderful jumble of art and engineering and everything else all tossed in together. Every kid has something they are passionate about. Find a way to make that the first thing you discuss with them. It shows them that you care and that what they do is far more important than how they look. Ultimately, that is the best weapon to fight off all the other nonsense. MS: What was your favorite book as a child? AB: Go, Dog, Go! by P.D. Eastman was my favorite. I spent hour upon hour pouring over the illustration at the end and contemplating what I would do if I was invited to a big dog party like that. (We had dogs, but they never invited me to their parties.) The dogs in this book had a trampoline, a trapeze, and cake! How could a person choose? As I got older, I loved Nancy Drew & Trixie Beldon mysteries. I even had a detective club after school with my friend. Our pledge was the Miranda Act. Clearly, I also spent too much time watching Dragnet. MS: Who is your hero/heroine? AB: My biggest heroes are my parents. They worked so hard their entire lives so that their six kids could have good educations. My success is only possible because of them. My mom gave us all an enormous love of books. I was raised in a town of 300 people and our house had more books in it than the rest of the whole town. Including the school. That made an impression. My other heroes are my in-laws, my aunts and uncles and the people of their generation who literally saved the world in WWII. 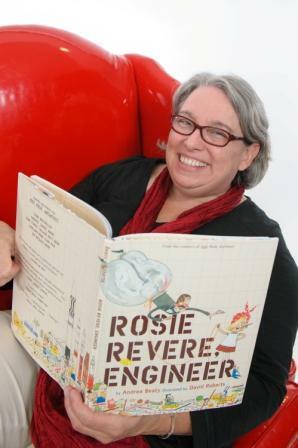 ROSIE REVERE, ENGINEER is dedicated to them. We have an unpayable debt to them for doing what was needed when it was needed the most.